Unveil a healthy looking radiance with the Perricone MD Healthy Skin & Body Set; combining a pair of advanced anti-ageing treatments with a superfood supplement to leave you feeling revitalized and replenished with a radiant complexion. 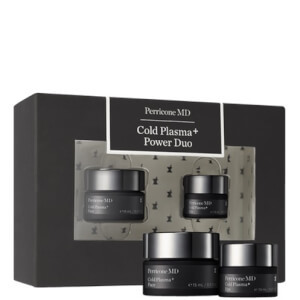 Help correct the ten most visible signs of ageing with the cult favourite Cold Plasma. Through Dr. Perricone’s patented proprietary delivery system, this powerful multi-tasking treatment offers essential nutrients and vitamins to help combat wrinkles, enlarged pores, dryness, redness, discolouration, uneven skin tone, impurities, loss of firmness, loss of smoothness and loss of radiance. Inspired by Dr Perricone’s original 1997 Face Firming Activator, the concentrated serum contains high levels of proprietary ingredients that have been clinically proven to soften the look of wrinkles and impart radiance. Fortified with Alpha Lipoic Acid, DMAE and Vitamin C Ester, it effectively refines the surface layer and improves elasticity levels for a firmer and visibly tightened appearance. A specially formulated blend of Acai Berries, Blueberries and Raspberries combine to deliver essential antioxidants. Add to smoothies or porridge for a quick hit of phytonutrients that work to promote energy, combat free radical damage and enhance skin’s natural luminosity. Cold Plasma: After cleansing skin, use fingertips to apply all over the face a pea-sized amount. Activator: After cleansing skin, dispense 1 to 2 pumps onto fingertips. Apply to the face and neck in the morning. For optimal firming results, apply product to the jawline, extending to the back of the neck and behind the ears. Follow with a Perricone MD moisturizer. Super Berry Powder: Mix one packet in water or smoothies 1-2 times daily. Activator: Water/Aqua/Eau, Dimethyl MEA, Thioctic Acid, Isopropyl Palmitate, Cetearyl Alcohol, Tyrosine, Glycolic Acid, Dimethyl Isosorbide, Propanediol, Glyceryl Stearate, PEG-100 Stearate, Urea, Ceteareth-20, Cyclopentasiloxane, Ammonium Acryloyldimethyltaurate/VP Copolymer, Dimethicone, Xanthan Gum, Phenoxyethanol, Phosphatidylcholine, Caprylyl Glycol, Hydroxylated Lecithin, BHT, Zinc Gluconate, Magnesium Aspartate, Acetyl Tyrosine, Disodium EDTA, Pyridoxine HCl, Zinc Sulfate, Pantethine, Fragrance/Parfum, Sorbic Acid, Copper Gluconate, Sodium Hyaluronate, Linalool, Citronellol, Geraniol, Limonene, Citral.